The prevalence of the obstructive sleep apnoea is increasing worldwide with the growing obesity epidemic. Current estimates suggest 2% of women and 4% of men in Western countries are affected by the condition. In this article, we shall look at the risk factors, clinical features and management of obstructive sleep apnoea. The main risk factor associated with obstructive sleep apnoea is obesity. Other risk factors include male gender, middle-aged, smoking or excess alcohol, or use of sedating drugs. In children, tonsillar and adenoid enlargement can cause partial obstruction of the upper airways, leading to obstructive sleep apnoea. Figure 1 – Collapse of the upper airways in obstructive sleep apnoea. The greatest risk factor for this condition is obesity. The classic presenting features of obstructive sleep apnoea are excessive daytime sleepiness and reduced concentration. 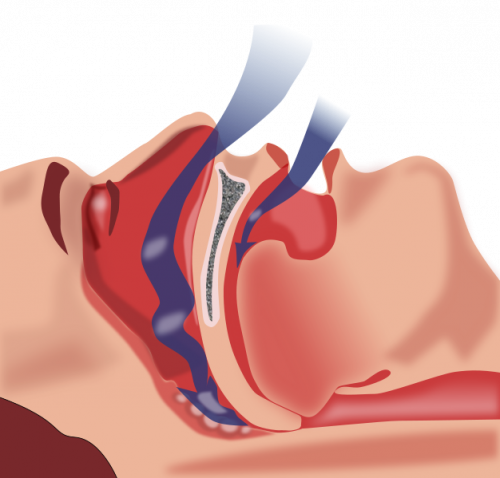 Witnessed sleeping disturbance is commonly described by others, such as choking episodes or observed apnoea. Other less specific features can include personality changes, reduced libido, or restlessness. Most patients are typically obese yet examination is usually otherwise unremarkable; NICE guidance recommends also enquiring about the possible presence of any symptoms of head and neck cancers during assessment. Ask about the effects of daytime sleepiness on driving, work performance, relationships, and mood (in children, ask about school performance, concentration, and behaviour). The impact of obstructive sleep apnoea can also be quantified using the Epworth Sleepiness Scale. Other causes of nocturnal choking or gasping include GORD, nocturnal asthma, or heart failure (presenting as paroxysmal nocturnal dyspnoea or orthopnoea). Obstructive sleep apnoea is formally diagnosed via sleep studies, the gold standard of which is typically polysomnography (PSG). PSG aims to measure the number of apnoeic or hyponoeic episodes per night, calculated as an Apnoea-Hypopnoea Index (AHI). As most cases of obstructive sleep apnoea occur secondary to obesity, patients should be offered advice regarding lifestyle changes where appropriate. This includes weight loss, increased exercise, smoking cessation, and alcohol reduction. 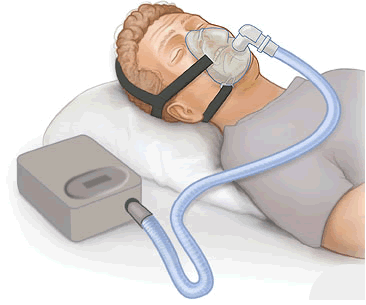 For patients with moderate to severe OSA, continuous positive airway pressure (CPAP) is first line treatment (Fig. 2). CPAP works by providing a positive pressure of air during the night to splint the airways open, preventing any further hypoxic episodes. For those with mild OSA or unable to tolerate CPAP, intra-oral devices, such as a mandibular advancement device, can be trialled to varying degrees of success. Pharmacological and surgical interventions have poor evidence-based outcomes*. Surgical interventions that can be trialled include uvulopalatopharyngoplasty (UPPP), laser-assisted uvulopalatopharyngoplasty (LAUP), radiofrequency ablation of the tongue base, or suspension of the hyoid bone. Select patients may also benefit from orthognathic surgery. Children with tonsillar and/or adenoid enlargement resulting in OSA will significantly benefit from tonsillectomy and/or adenoidectomy with excellent long-term outcomes. *There is growing evidence that transoral robotic surgery for tongue base reduction can produce good results. Patients with obstructive sleep apnoea need to be made aware of the impact their daytime sleepiness can have, particularly on work and driving. In the UK, any patients on CPAP treatment should inform the DVLA. Obstructive sleep apnoea can result in significant cardiovascular co-morbidity, increasing the risk of developing hypertension, ischaemic heart disease and stroke. Treating OSA successfully reverses these risks. Consequently, all patients with obstructive sleep apnoea should have their cardiovascular risk profile regularly calculated and managed accordingly. Patients with OSA also have significant impact on their quality of life as there are long term effects on memory, cognitive function, and mood. It has also been associated with increased strain on relationships. Early treatment of obstructive sleep apnoea with CPAP has an excellent prognosis, with near normal cardiovascular function and all-cause mortality rates in treated individuals. What is the current estimated prevalence for men in Western countries affected by the condition? An Epworth Sleepiness Scale score of 17 is what severity of OSA? What is gold standard of diagnosis for Obstructive Sleep Apnoea? Which is an important risk associated with having untreated OSA?